If you pick out gifts from a shopping mall, the chance is that you will not find unique gifts. After all, the definition of unique gifts is that not everyone else and their grandmothers will have the same thing. That’s like trying to find unique flavors at Denny’s. Don’t get me wrong, there’s nothing wrong with Denny’s; I certainly appreciate being able to grab some grub at 3 am, but it’s no French Laundry. When you want to make strong impressions with unique gifts, there are several routes you can go. The first way is personalize your gifts. Even though you basically are gifting a common item, putting their names or your unique message on the items make it one of a kind. The second way is to commission a unique creation from scratch. It might sound like an expensive endeavor, but in this day and age, creating something from scratch is achievable without paying an arm and a leg. In fact, you might be able to create something right from the comfort of you own home using your computer and the web. You can take advantage of 3-D printing and custom design something using hundred different kinds of material at sites like ponoko.com. However, procrastinators beware—it usually takes weeks to craft an item, so you can’t expect the gift to arrive at your door tomorrow. Plan ahead! The third way to find unique gifts is getting them from independent artists. You certainly don’t have to travel far to find some talented ones. Again, they are right at your fingertips. In places like Etsy, you can find thousands of artists and crafters to fight for your business. You might say that is a place where chicks shop, and you are probably right. I don’t know the exact demographics of Etsy visitors, but it’s dominated by estrogen without a doubt. Now, if your girlfriend, wife, mom, mother-in-law, daughter and aunt like to shop or browse there, doesn’t it tell you something? They like the stuff there! So check it out to find unique gifts. However, you do have to sort through them, which is why I can point you to a thing or two in that site below. And the fourth way to find unique gifts is from vintage or antique shops. You are likely to have more luck if you head over to a physical store, although you can also find some online on sites like eBay or Etsy. Beware though! Be sure to find out whether the recipients like vintage or antique items. I have friends who abhor them and call them “dirty old used stuff”. Some people like their things shiny and new. However, for the ones who appreciate vintage items, receiving a unique piece is like finding gold in her pocket. 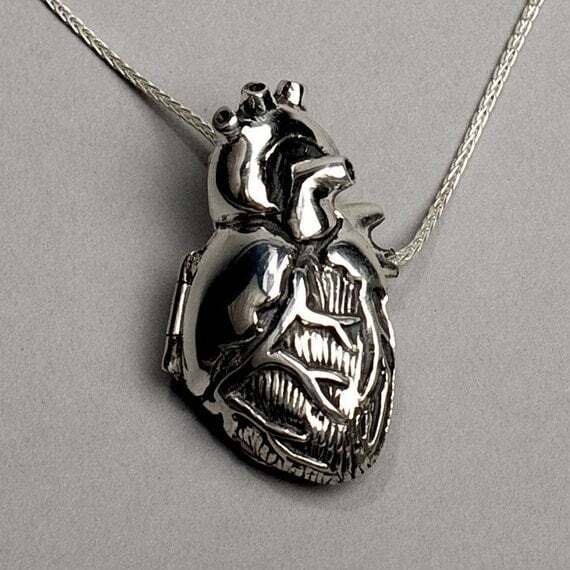 Silver Anatomical Heart Locket—you think giving anything heart-shaped is too cheesy? I am totally with you. That’s one of the myths of buying jewelry for a woman. Guys always think that it’s romantic. However, heart-shaped jewelries should really be reserved for girls under age 21. If she is a mature classy woman, you are better off skipping that old heart-shaped pendent. This, however, is something way cool. It portraits an anatomically correct heart. It’s actually a bit geeky, which is way in these days. Clock and Dock for her iphone—this playful dock will put a smile on her face first thing in the morning. Who needs a high-tech alarm clock when you’ve got Siri to wake you up? The creator of this modern piece can even customize the material per your request. For you love birds out there, this You & Me – Eternal Love metal sculpture is just plain sweetness. This item is inspired by everything one can find in the scrape yard, yet it is actually created using 3-D printing. t is the perfect gift for your cute sweet girlfriend to show your love, affection and commitment. The artist can even etch your initials on it. 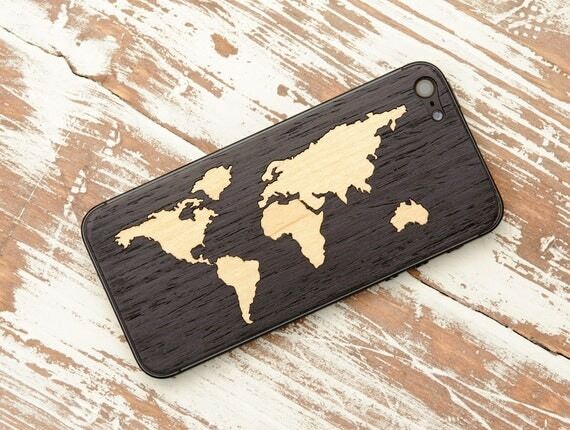 If your woman is an avid traveler, she will love this Ebony World Map Inlay iPhone 5 Real Wood Skin. It is an elegant piece of art and practical enough to protect her smart phone. This artist also creates skins for other models of phones. A custom portrait on canvas is always a nice way to capture the precious moment. Dig out your favorite picture with her and create this one of a kind gift. She can then be reminded of the great times she had with you. These guys will even help you touch up the photo if needed. You can get $20 off by using the code OCTSAVE20 (valid in October only). Give her a secret message by gifting this Morse Code Silk Monogram Bracelet. Make your mark by dots and dashes, just like how people used to communicate in the old days. It’s a bit geeky, but way cool. Speaking about geekiness, this necklace could be a top contender. If she loves her morning (lunch-time, afternoon, 3 pm, dusk, dinner or bed-time) coffee, then you will appreciate this little humorous Caffeine Molecule necklace- Coffee Cup pendant. For the traditional recipients who are still into the art of snail mail, give them this Rachel Custom Address Stamp. She can then send her letters and cards in style and elegance, instead of using those complimentary address stickers that charities use to lure her donation. There are over 170 styles of address stamps to choose from. 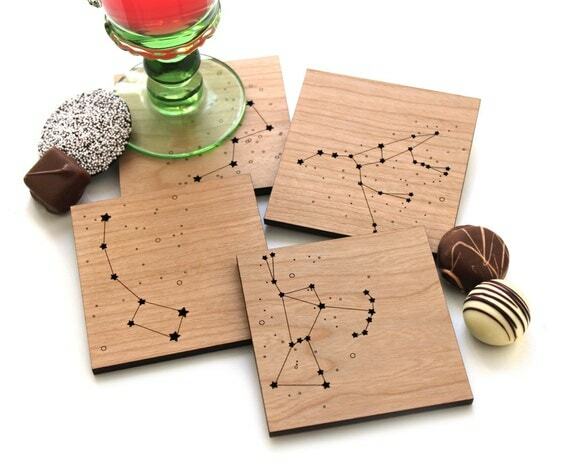 For the romantics, these Wood Coasters – Star Constellations will steal her heart. Now she can gaze the stars without leaving her couch. This set of coasters contains 4 coasters featuring these constellations: Ursa Major, Ursa Minor, Cassiopeia and Orion. Is she into nature and animals? 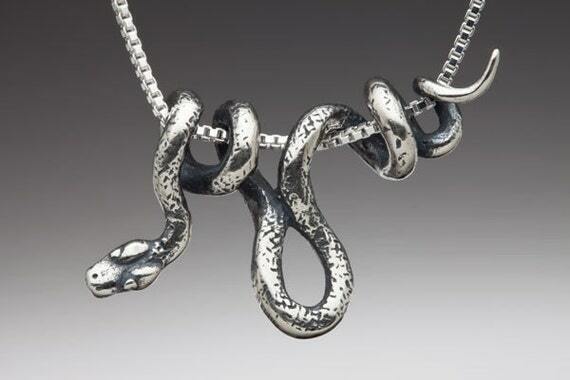 Then she will be delighted to receive this Silver Vine Snake Pendent. It is designed and crafted in California; you certainly cannot find it in your neighborhood mall.